Be the first to share your favorite memory, photo or story of Garfield. This memorial page is dedicated for family, friends and future generations to celebrate the life of their loved one. 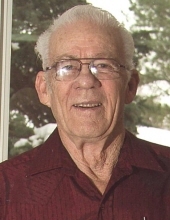 Garfield “Gar” Jermunson, 88, of Great Falls and formerly of Brady, passed away Wednesday, March 13, 2019 at his home. Urbin Garfield “Gar” Jermunson was born June 22, 1930 in Conrad, Montana to Gunerius “Gun” and Bertha Jermunson. He grew up on the family farm east of Brady, Montana. He attended Brady Public Schools but had little success because of a then unknown diagnosis of Dyslexia. After being “kicked out of the 3rd grade for not shaving,” he left school at the age of 17 to join the U.S. Navy. He served during the Korean War on the USS Princeton, USS Rehoboth and the USCGC Redbud naval ships, traveling the world for 4 years. He returned to Brady and took over the operations at the farm. Gar married Joyce Johnson on January 10, 1956 and he took extremely good care of her their entire marriage. Gar’s lifelong dream was to learn to fly. In order to afford flying lessons, he gave up smoking. Gar obtained his private pilot’s license in 1963. The following day, his friend and fellow pilot, Leonard Johnson flew over to buy a Super Cub. He quickly acquired his aerial applicator’s license and Gar and Leonard started J & J Aerial Spraying. Over the years Gar owned and flew as often as he could Super Cubs, a Commanche PA-24, Pawnee, Piper 180, Stinson SR7B, Van’s RV4 and RV8. He enjoyed fly-ins and each year flew with the Antique Aircraft Association on tours of various locations throughout the western United States. Gar was a member of AOPA, Vintage Aircraft Association and Experimental Aircraft Association. He flew until he was 82 years old. Flying was his passion, his release, his everything. He was a lifetime member of the Elks, member and supporter of the CM Russell Museum, the Conrad Transportation and Historical Museum, the American Legion and the Sons of Norway. Gar is survived by his wife, Joyce; son Tim Jermunson; daughter Garla (Tim) Boland; granddaughters Genna and Ellen Boland, and Katie (Kory) Chartier; several cousins, nieces and nephews, and 3 great-grandchildren. He was preceded in death by his parents; brothers Carter (Alice) and Neil (Paula) Jermunson; sister Rachel (Jack) Schumacker; and step-brother Russell (Dorothy) Jermunson. Gar always said he wasn’t going to your funeral, so he didn’t expect you to come to his. Cremation has taken place and a private family gathering will be held at a later date. O’Connor Funeral Home is handling the arrangements. Memorials in Gar’s name may be made to the aerial organization of your choice or the Brady Community Hall, Brady, MT 59416. To plant a tree in memory of Garfield "Gar" Jermunson, please visit our Tribute Store. "Email Address" would like to share the life celebration of Garfield "Gar" Jermunson. Click on the "link" to go to share a favorite memory or leave a condolence message for the family.